4 The Pelican Friday, April 5, 2013 By Judy WilsonPELICAN STAFFDeer eld Beach Marine interests here have drawn a proposal that, if accepted by the city commission, will improve access to local waterways, establish a nautical art program and create signature events with a nautical theme. In addition, the business group headed by former re rescue administrator Jim Mathie, is asking the city to establish a marine advisory committee, install mooring buoys along Angels Reef for divers, work to build an arti cial reef, establish a system of oating docks for kayak and paddle-board users and ask the water management district to deepen the Hillsboro River east of Military Trail. Additionally, the group wants to help the city design the maritime village being proposed for Sullivan Park. Purpose of the plan presented Tuesday at the commission meeting is to Plan aims to make Deer eld Beach a nautical destinationpromote the city as a nautical destination for visitors and as a place to live with opportunities for recreation and business near the water. It is a 44-page analysis of the areas existing marine amenities and what is needed in the way of improvements. On Mathies team are major business owners such as Marina One, 2 Georges at the Cove, the Wyndham Beach Resort, Island Water Sports, Riva Motorsports, Dixie Divers, Oceans 234, Embassy Suites, Skirixen as well as the Greater Fort Lauderdale Convention and Visitors Bureau and the Deer eld Beach Chamber of Commerce. Already accomplished is one of their goals: a local map that highlights the citys nautical destinations and which is now being distributed by the chamber. Deer eld Beach is currently ranked fth among Browards 32 municipalities in the amount of tourist tax collected. Promoting the city as a nautical destination should increase this amount and improve our overall ranking, Mathie said. In 2011, this city sent $1.7 million in bed tax revenues to the county. Tourism is Browards number one economic engine, Mathie added. To be a player, destinations need to nd their niche and brag about it. Come aboard and help promote us. Integral to the image of Deer eld Beach as a nautical destination is the establishment of a funded public art program that emphasizes nautical themes such as the mural by artist Rick Novak at the 2 Georges. Public art is encouraged and funded with development and redevelopment fees. In Boynton Beach, one percent of the cost of all commercial development is set aside for public art. Last year Pompano Beach approved an ordinance establishing a two percent share of each public project for art. Also presented for consideration was a logo design consisting of the pier, a wave and a rising sun. Commissioners accepted the destination plan without comment except for Joe Miller who said he favored the idea of branding our city and asked if staff would look into the proposal. DBES sets Round-Up for kindergarten parentsDeer eld BeachAnother Kindergarten Round-Up will be held at Deer eld Beach Elementary School, 60 NE 1 St. April 10, 6 to 7 p.m. in the media center. Parents will meet staff and learn about curriculum and school activities. To enroll in kindergarten, children must be age ve by Sept. 1, 2013 and provide original birth certi cate, two proofs of residency, current Florida Immunization Record and physical exam form. Call 754-322-6100. 6 The Pelican Friday, April 5, 2013 Pompano Beach, Deer eld Beach, Lighthouse Point, Lauderdale-By-The-Sea, Wilton Manors, Oakland Park and Hillsboro Beach The Pompano Pelican is published weekly on FridaysStreet Address: 1500-A E. Atlantic Blvd., Pompano Beach, FL 33060 Telephone: 954-783-8700 Fax: 954-783-0093Letters to the Editor are encouraged and accepted for print if signed, although a writers name will be withheld on request; letters must also include a daytime telephone number. Advertising rates are available upon request. Subscription rate is $31.80 including tax for one years delivery in Greater Pompano Beach; $95.40/per year including tax for others in the United States; call 954-783-8700 for rates abroad. 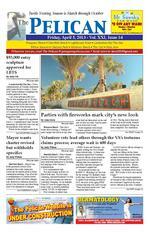 The Pelican is a nonpartisan newspaper and reserves the right to decline advertising. Copyright 2013. Reproduction of this publication in whole or in part is prohibited without written permission of the publisher. The Pelican is a member of the Greater Pompano Beach Chamber of Commerce, Deer eld Beach Chamber and the LBTS Chamber. The Pelican is a state certi ed woman-owned minority business. The Pelican is delivered to businesses, libraries, schools, of ces, hospitals, news racks and single family homes. All advertising and copy is published at the sole discretion of the publisher. We welcome your critiques and ideas concerning this publication. Anne Siren, publisherExecutive Assistant: Mary Hudson Graphics: Rachel Ramirez Windsheimer Bookkeeper: John White, Christopher Siren Classi eds: Fran Shelby Contributing Writers: Phyllis J. Neuberger, Judy Wilson, Malcolm McClintock, Judy Vik, Michael dOliveira Circulation Joe McGeeAccount Executives: Paul Shroads, Carolyn Mann, Bill Heaton, Bill Fox Special Of ce Assistant: Cathy Siren ESTABLISHED 1993 Volume XXI, Issue 14 Founding Editor and PublisherAnne Hanby Siren Call 954-783-8700 or send your letters to the editor to mdpelican@yahoo.com Opinion & Letters Unity in the Commnity of Pompano Beach is pleased to announce that two scholarships in the amount of $1,000 each will be presented this year to local highschool students. The quali cations are: the applicant must be a resident of Pompano Beach, have a GPA of 2.0 or greater, family income must not exceed Broward County median income, be drug and crime free and of good moral character, have completed 40 hours of community service, complete a 500-word essay and have been accepted to attend a college or vocational institute for the 2013-2014 school year. Applications are available at the CRA Business Resource Center, 50 NE 1st St., Pompano Beach, 33060, or they may be requested by sending an email to Carolyn Mann at carpelican@gmail.com. Completed applications must be received by April 30. Please mail or deliver the application and requirements to: Unity in the Community, 50 NE 1st St., Pompano Beach, FL 33060.College scholarships open to Pompano Beach residents Tonight, weather permitting, this citys residents will join of cials to celebrate much more than the new look of Pompano Beach, they celebrate teamwork. A year into the great economic crash, Pompano Beach commissioners stayed the course with their plans to redevelop the beachfront, what little the developers left for us.Celebrate Pompanos new look tonightPompano Beachs CRA shines brightly with its latest projects at the beach on the BoulevardWhile all of us were thrilled with renderings of what could happen, mistrust and fear of change often took a front seat. Then we went through months of dust in the air, disappearing parking spots, torn up sidewalks and lost customers. Tonight all those memories begin to fade. Pompano Beach has never looked so good with the renovations, redevelopment and restorations that have taken place since Kim Briesemeister and Chris Brown took leadership of the citys Community Redevelopment Agency, or CRA. They came in as pros, and they withstood the doubts and complaints that always arise when change raises its ugly head. Tonight, the champagne glasses should point in the direction of Briesemeister and Brown as we all get used to a new pride in Pompano Beach. Brown said it best. April 5 is the turning point for Pompano Beach. Tonight is our chance for residents to see that a city can really change.Bicycle RodeoPompano Beach The City of Pompano Beach, in conjunction with Florida Bicycle Month, will hold its Bicycle Rodeo on Saturday, April 6 from 8 to 1 p.m. at McNair Park, 951 NW 27 Ave. There will be bicycle safety information, food and more for families and children of all ages. The event is free. Call 954786-7882. Sheriffs charity golf tournamentBroward The Sheriffs Foundation of Broward County and the Broward Sheriffs Of ce are hosting the 2nd Annual Sheriffs Cup Golf Tournament on Monday, May 6 at the Weston Hills Country Club, 2600 Country Club Way, Weston. Registration is at 8 a.m. and. The tournament starts at 9:30 a.m. Cost is $125 per golfer or $500 for a foursome. The money raised will bene t nonpro t charities in Broward County. Visit www.birdeasepro.com/sheriffscup for more information.Classic Car ShowPompano Beach The Cruisin South Florida Classic Car Show takes place Saturday, April 20 at Pompano Citi Centre at the corner of Copans Road and Federal Highway, from 10 a.m. to 4 p.m. Cars from many different eras will be on display. The juried show is free to the public. There will be special giveaways for attendees. Car owners can pre-register by calling Russ Gagliano at 954-560-5412 or by email at russgevents@gmail.com.Youth basketball registrationOakland Park Registration has begun for the Summer Youth Basketball League. Parents can register children ages 7 to 16 [as of June 3] at city hall, 3650 NE 12 Ave., or online [www.oaklandpark .org] until the league is full. Registration fee is $55 for residents and $100 for non-residents. There will be separate age divisions for girls and boys. Call 954-630-4506.Recycling cartsWilton Manors On Monday, April 22, residents in single-family homes will start to receive the new roll-out recycling carts. The 65-gallon carts will be dropped off at each single-family home. Residents can keep their old recycling bins or put them on the curb to be picked-up. Residents can start using their new carts on Monday, April 29. For more information, call 954-390-2100.Seafood Festival returnsPompano Beach The 29th Annual Pompano Beach Seafood Festival takes place over three days from Friday, April 26 to Sunday, April 28 at the Pompano Beach Fishing Pier, 222 N. Pompano Beach Blvd. Cost is $15 per person per day. Children 12 and under are free. In addition to the food and merchandise sold throughout the weekend, there will also be live entertainment every day and night. On Friday, 5 to 10 p.m., Fourth Dimension and Never Stop Believing will perform. Saturdays lineup, 10 a.m. to 10 p.m., includes Brass Evolution, Ploomie, Low Tides and Special. On Sunday, 11 a.m. to 8 p.m., Two Can Blue, Across the Universe and Jimmy Stowe and the Stowaways will be performing. Part of the proceeds from the event bene t local charities, including local school activities. Visit www.pompanobeachseafoodfestival.com for more information.Low cost rabies clinicFort Lauderdale Broward County Animal Care and Adoption will host a rabies clinic on Saturday, April 6 from 9 a.m. to 2 p.m. at Roosevelt Gardens Park, 2841 NW 11 St. Pet owners can purchase low cost vaccinations for dogs or cats to protect them against rabies. Cost for a one-year rabies vaccination and registration tag is $15 per pet. Cash only payments will be accepted. To qualify, pet owners must provide proof of Broward County residency, such as a valid Florida drivers license or a current utility bill. No appointment is necessary. Customers are taken on a rst come, rst served basis. All dogs must be on leashes and all cats must be in carriers. Call 954-359-1313.Classic movies for $1Lauderdale-By-The-Sea In the mood for a nostalgic movie? Every second Friday of the month at 6:30 p.m., a classic lm is played at Jarvis Hall, 4501 N. Ocean Dr. The selection for April 12 is Singin in the Rain. Tickets are $1. Funds raised during the event bene t the American Diabetes Association. On May 11 Dr. Zhivago will be played. Grease will be shown on June 8. Attendees are encouraged to come dressed as their favorite character from the movie being shown. Call 954-449-4368. 8 The Pelican Friday, April 5, 2013 Fireworks at the beachPompano Beach The grand re-opening of East Village and the Beach takes place on Friday, April 5 from 5 to 10 p.m. at Harbor Village Shoppes, located at Atlantic Boulevard and Northeast 27 Avenue. To celebrate, the city will have a ribbon cutting at Harbor Village Shoppes at 6:30 p.m. and re works at 8:30 p.m. on the beach. There will also be live music from 6 to 10 p.m., an interactive art project and childrens activities. City of cials will also turn on the water fountain built on the beach at the east end of Atlantic Boulevard at 7:30 p.m. Call 954-786-7824. Send your news to mdpelican@yahoo.com By Judy VikPELICAN STAFF Pompano Beach City commissioners this week authorized the CRA staff to negotiate with Landmark Development Corp. to construct a mixeduse development at MLK Boulevard and Northwest Sixth Ave. The vote was 5-1, Vice Mayor George Brummer dissenting. Landmark, a Miamibased rm, was one of two rms to submit a request for proposal to develop the site. The second, Pinnacle Housing Group, which proposed senior housing, withdrew from consideration last week. Landmark proposes to build up to a seven-story building with the rst oor retail/ commercial and residential oors above. Retail space, fronting on MLK Boulevard, would be about 4,000 square feet. The proposal also calls for a three-story parking structure with 160 spaces. The developer proposes to build about 127 living units ranging from one to three bedrooms. Cost is $22.5 million and will be paid for in CRA [Community Redevelopment Agency] tax credits.Plans for mixed-use on MLK Boulevard move forwardA family of four would be eligible to rent a unit with a maximum income of $40,800. It looks like were on our way nally, said Commissioner Woody Poitier. I think its a good project. Im all for this project. Brummer questioned whether one respondent was suf cient. He wondered if the city should seek more proposals. I dont think this does anything positive for the community except to build something where there is nothing, Brummer said. Were putting more subsidized building into the community. We could do something with higher rentals. He noted that the new bus depot is within easy walking distance, and eventually the area will have a rail station. And he said hes not that sold on mixed-use development. It really doesnt work. You can only have so many barbers, beauty shops and cleaners. Brummer suggested rejecting this proposal and looking for something better. Kim Briesemeister, coexecutive director of the CRA, noted the area has been designated for transit-oriented development and a mixed-use district. She said the district will have mixed incomes and a combination of uses. Commissioner Rex Hardin, while noting he would support going forward with negotiations, said he was concerned were limiting our future and limiting our potential. Were almost saying thats all that area will support. Brummer said theyre also looking for mixed use next to the bus station, questioning how much the neighborhood can absorb. We should try for something better. My aspirations are higher and my ambitions are greater, he said. Commissioner Barry Dockswell said, It is a mistake to paint all subsidized housing with the same brush. This is a great match and a great start. It will help kick start the area. Mayor Lamar Fisher said he would like to see more retail in the development. I think its a great t for what were trying to do and the right t for the property. This begins the availability to provide retail and residential. 12 The Pelican Friday, April 5, 2013 this years capital budget as part of the $1.2 million West Commercial Boulevard streetscape project. Design plans for the area also include four way nding plaza sculptures by Huck, estimated to cost about $100,000. At earlier meetings, Commissioner Mark Brown preferred starting with those four sculptures rather than the entryway feature. This week he asked for consensus on that idea. Only Vincent agreed with Brown and added that he wasnt sure the town should spend so much on the entryway sculpture. He suggested a better location for the piece would be El Prado Park. Im not happy with the cost, and I dont know if this monument at that location says this is Lauderdale-ByThe-Sea, Vincent said. He said more discussion was needed. Mayor Roseann Minnet said she didnt concur with Vincent at all. We have talked about the entry and how when you cross the bridge you dont know you are in LauderdaleBy-The-Sea. This will bring the coral reef to you, she said. It will look magni cent, and at night when its all lit up you will see it before you cross the bridge. Minnet said she feels the entryway sculpture is very important. The piece will make the town visible from so many places. We need that signature as you come into town. Lauderdale-By-The-Sea hasnt created its own picture frame, and this will start that. The mayor then read portions of a letter from the artist, Laura Huck. Art is a great uni er and de ner of a community. I can only think how natural it is for everyone to take note of the pelican sculpture at the end of Commercial Boulevard. The series we have planned will be even brighter and more eyecatching. Not only that, it will draw attention to the treasure trove of accessible reef off your beaches. Very few improvements to a townscape, such as you are planning, will have as much impact as the art. Huck said the main piece, the Coral Arch, is the rst thing people will see as they enter the town. It will say, This is not an ordinary community, but a community with much to offer. The Coral Arch is designed to wow, in the day with its bright colors and details, and at night, when lit, with its glowing rays. Minnet urged commissioners to approve executing the agreement and to start with the Coral Arch. Commissioner Stuart Dodd said he agreed, that the Coral Arch sculpture makes a huge statement. I think we should go ahead. Vice Mayor Scot Sasser said he was in full agreement with the mayor and with Dodd. Were talking about the entry and a true piece of art. Sasser, however, still seemed baf ed by an earlier decision. I think Im in a dream world when everyone voted for a 33-foot Las Vegas parking lot sign to put in the center of the downtown. [That sign was later modi ed to 30 feet.] This [the entryway sculpture] is much more important than the other, he said. Vincent said he never SculptureContinued from page 1suggested the entryway sculpture wasnt a beautiful piece of artwork. It wont be seen or recognized at that location. It wont be appreciated by pedestrians or by vehicular traf c going east.State approves $100,000 grant for landscaping on Commercial In related news, Town Manager Connie Hoffmann announced Tuesday that state of cials have approved the towns grant application for $100,000 to assist with landscaping costs for the West Commercial Boulevard streetscape project. This is a matching grant from the Florida Highway Beauti cation Council, and the town is committed to match it with $202,000 in additional landscaping monies. Hoffmann credited staff member Pat Himelberger and Hugh Johnson of Architectural Alliance for their work on the grant. Himelberger wrote the grant application, and Johnson modi ed the tree selection to improve the towns chances getting the funding. Lighthouse tours April 20Hillsboro Beach A tour of the Hillsboro Lighthouse will be offered Saturday, April 20. To participate, meet Hillsboro Lighthouse Preservation Society members at the Sands Harbor Marina, 125 N. Riverside Drive, Pompano Beach, beginning at 8:45 a.m. The rst boat launches at 9 a.m. and the last boat leaves at 2:30 p.m. The tour is free for Hillsboro Lighthouse Preservation Society members and $15 for non-members. The annual cost to join the Preservation Society is $25 for individuals, $35 for a family, $50 for a business and $500 for a lifetime membership. For more, visit www.hillsborolighthouse. org or call 954-942-2102. 16 The Pelican Friday, April 5, 2013Send your events for publication to mdpelican@ yahoo.com municipal contract in 2012 in Miramar breaking into a market controlled for 20 years by Wheelabrator, a subsidiary of Waste Management. Its website cites its commitment to zero waste for the cities it serves and its contracts guarantee 75 percent of the solid waste collected will be recycled.HillsboroContinued from page 3 more claims than any other chapter, more than 500 a year. A large number of the vets applying for assistance here qualify because the government has taken responsibility for the illnesses caused by Agent Orange which has a long list of diseases from cancer to arthritis associated with the chemical. And it has now been determined that the chemical still affects future generations, the grandchildren of the Vietnam servicemen. To establish exposure to Agent Orange counselors have to match the veterans service record with military records that show the exact place time and amount of Agent Orange that was used to defoliate the jungles. Having access to all this history is important to the outcome of the claim. The local DAV volunteers VetsContinued from page 1are available 10 a.m. to 2 p.m. every Tuesday at the Legion, 820 SE 8 Ave. No appointment necessary. Additionally, these volunteers spend four days a year being recerti ed at a seminar held at Lake Mary, FL. The system is intimidating and these guys know the language of the VA, says Acting Cmdr. Don Carney. Im not dumb, but it confuses me. Since the damaging effects of service-related injuries may not occur for years, returning vets from Iraq and Afghanistan need to start keeping track of their records now for future needs, Roth said. The VA compensates for physical and mental disabilities and, for veterans or their spouses on very low incomes, provides a pension. Bene ts, if awarded, are retroactive to the date the claim was started. Healthcare is available at VA hospitals with a minimum of paperwork. Often these disabilities dont surface until the vet ages requiring years of documentation. While these local service of cers are skeptical that the VA will go electronic anytime soon, they are looking for sponsors who will contribute money for computers, printers and wiso they will be ready when it does happen. Indicating the work going on behind him, Carney said, These guys are doing the right thing. Id like to see it get known that they are available. While the DAV does not give direct nancial assistance to vets in need, members of the chapter provide transportation, visit nursing homes to help residents with their claims, make some home repairs. They stress that all their time and their talents are given for free and caution that anyone being charged a fee to get help with their claim application is being ripped off. One widow who met with them this week reported being charged $750 by a VA rep. The service of cers also advise their clients of other legal rights such as the additional Homestead Exemption. Said Citrolo, The reward is in helping people, and Butler added, We are handful of people who dont mind ghting for other people. The local DAV chapter raises money by holding car shows and golf tournaments and manning their information booth at public events. Other service of cers from the Goldcoast Chapter are Bob Kontz, Jim Zane, Dave Nystrom, Gerg Chaipponi, Tom Perry and Chuck McLaughlin. The Pelican 27 Friday, April 5, 2013 In my artwork, I paint when I see it, she said. Wetzsteins work also comes from what he spots. Along with frames for Andersons art, he also takes ArtHallContinued from page 21driftwood and mostly turns it into tables and lamps. I came from the Keys so Ive always been in the mangroves with my dad. And hes not too picky. Wetzstein has found and used pieces of oak, Dade County pine and tiki. But his favorite is mahogany, especially the stuff that drifts here from Cuba. His greatest find was a refugee boat in the Keys last year. That had a lot of real colorful wood. Anderson and Wetzsteins work will be on display at the CRA Business Resource Center until April 16. Call 954-586-1111 for more information. Andy Cherenfant, loan manager for the International Enterprise Development, with Srah Ysrael, a volunteer at the Business Resource Center, at the wine table at ArtHall on March 20.Tell The Pelican about your news! Email mdpelican@ yahoo. com or 954-783-8700! The Pelican 29 Friday, April 5, 2013 STOP HERE! 4 The Pelican Friday, April 5, 2013 By Judy WilsonPELICAN STAFFDeer eld Beach  Marine interests here have drawn a proposal that, if accepted by the city commission, will improve access to local waterways, establish a nautical art program and create signature events with a nautical theme. In addition, the business group headed by former re rescue administrator Jim Mathie, is asking the city to establish a marine advisory committee, install mooring buoys along Angels Reef for divers, work to build an arti cial reef, establish a system of oating docks for kayak and paddle-board users and ask the water management district to deepen the Hillsboro River east of Military Trail. Additionally, the group wants to help the city design the maritime village being proposed for Sullivan Park. Purpose of the plan presented Tuesday at the commission meeting is to Plan aims to make Deer eld Beach a nautical destinationpromote the city as a nautical destination for visitors and as a place to live with opportunities for recreation and business near the water. It is a 44-page analysis of the areas existing marine amenities and what is needed in the way of improvements. On Mathies team are major business owners such as Marina One, 2 Georges at the Cove, the Wyndham Beach Resort, Island Water Sports, Riva Motorsports, Dixie Divers, Oceans 234, Embassy Suites, Skirixen as well as the Greater Fort Lauderdale Convention and Visitors Bureau and the Deer eld Beach Chamber of Commerce. Already accomplished is one of their goals: a local map that highlights the citys nautical destinations and which is now being distributed by the chamber. Deer eld Beach is currently ranked fth among Browards 32 municipalities in the amount of tourist tax collected. Promoting the city as a nautical destination should increase this amount and improve our overall ranking, Mathie said. In 2011, this city sent $1.7 million in bed tax revenues to the county. Tourism is Browards number one economic engine, Mathie added. To be a player, destinations need to nd their niche and brag about it. Come aboard and help promote us. Integral to the image of Deer eld Beach as a nautical destination is the establishment of a funded public art program that emphasizes nautical themes such as the mural by artist Rick Novak at the 2 Georges. Public art is encouraged and funded with development and redevelopment fees. In Boynton Beach, one percent of the cost of all commercial development is set aside for public art. Last year Pompano Beach approved an ordinance establishing a two percent share of each public project for art. Also presented for consideration was a logo design consisting of the pier, a wave and a rising sun. Commissioners accepted the destination plan without comment except for Joe Miller who said he favored the idea of branding our city and asked if staff would look into the proposal. DBES sets Round-Up for kindergarten parentsDeer eld Beach Another Kindergarten Round-Up will be held at Deer eld Beach Elementary School, 60 NE 1 St. April 10, 6 to 7 p.m. in the media center. Parents will meet staff and learn about curriculum and school activities. To enroll in kindergarten, children must be age ve by Sept. 1, 2013 and provide original birth certi cate, two proofs of residency, current Florida Immunization Record and physical exam form. Call 754-322-6100. 6 The Pelican Friday, April 5, 2013 Pompano Beach, Deer eld Beach, Lighthouse Point, Lauderdale-By-The-Sea, Wilton Manors, Oakland Park and Hillsboro Beach The Pompano Pelican is published weekly on FridaysStreet Address: 1500-A E. Atlantic Blvd., Pompano Beach, FL 33060 Telephone: 954-783-8700  Fax: 954-783-0093Letters to the Editor are encouraged and accepted for print if signed, although a writers name will be withheld on request; letters must also include a daytime telephone number. Advertising rates are available upon request. Subscription rate is $31.80 including tax for one years delivery in Greater Pompano Beach; $95.40/per year including tax for others in the United States; call 954-783-8700 for rates abroad. The Pelican is a nonpartisan newspaper and reserves the right to decline advertising. Copyright 2013. Reproduction of this publication in whole or in part is prohibited without written permission of the publisher. The Pelican is a member of the Greater Pompano Beach Chamber of Commerce, Deer eld Beach Chamber and the LBTS Chamber. The Pelican is a state certi ed woman-owned minority business. The Pelican is delivered to businesses, libraries, schools, of ces, hospitals, news racks and single family homes. All advertising and copy is published at the sole discretion of the publisher. We welcome your critiques and ideas concerning this publication. Anne Siren, publisherExecutive Assistant: Mary Hudson Graphics: Rachel Ramirez Windsheimer Bookkeeper: John White, Christopher Siren Classi eds: Fran Shelby Contributing Writers: Phyllis J. Neuberger, Judy Wilson, Malcolm McClintock, Judy Vik, Michael dOliveira Circulation Joe McGeeAccount Executives: Paul Shroads, Carolyn Mann, Bill Heaton, Bill Fox Special Of ce Assistant: Cathy Siren ESTABLISHED 1993  Volume XXI, Issue 14 Founding Editor and PublisherAnne Hanby Siren Call 954-783-8700 or send your letters to the editor to mdpelican@yahoo.com Opinion & Letters Unity in the Commnity of Pompano Beach is pleased to announce that two scholarships in the amount of $1,000 each will be presented this year to local highschool students. The quali cations are: the applicant must be a resident of Pompano Beach, have a GPA of 2.0 or greater, family income must not exceed Broward County median income, be drug and crime free and of good moral character, have completed 40 hours of community service, complete a 500-word essay and have been accepted to attend a college or vocational institute for the 2013-2014 school year. Applications are available at the CRA Business Resource Center, 50 NE 1st St., Pompano Beach, 33060, or they may be requested by sending an email to Carolyn Mann at carpelican@gmail.com. Completed applications must be received by April 30. Please mail or deliver the application and requirements to: Unity in the Community, 50 NE 1st St., Pompano Beach, FL 33060.College scholarships open to Pompano Beach residents Tonight, weather permitting, this citys residents will join of cials to celebrate much more than the new look of Pompano Beach, they celebrate teamwork. A year into the great economic crash, Pompano Beach commissioners stayed the course with their plans to redevelop the beachfront, what little the developers left for us.Celebrate Pompanos new look tonightPompano Beachs CRA shines brightly with its latest projects at the beach on the BoulevardWhile all of us were thrilled with renderings of what could happen, mistrust and fear of change often took a front seat. Then we went through months of dust in the air, disappearing parking spots, torn up sidewalks and lost customers. Tonight all those memories begin to fade. Pompano Beach has never looked so good with the renovations, redevelopment and restorations that have taken place since Kim Briesemeister and Chris Brown took leadership of the citys Community Redevelopment Agency, or CRA. They came in as pros, and they withstood the doubts and complaints that always arise when change raises its ugly head. Tonight, the champagne glasses should point in the direction of Briesemeister and Brown as we all get used to a new pride in Pompano Beach. Brown said it best. April 5 is the turning point for Pompano Beach. Tonight is our chance for residents to see that a city can really change.Bicycle RodeoPompano Beach  The City of Pompano Beach, in conjunction with Florida Bicycle Month, will hold its Bicycle Rodeo on Saturday, April 6 from 8 to 1 p.m. at McNair Park, 951 NW 27 Ave. There will be bicycle safety information, food and more for families and children of all ages. The event is free. Call 954786-7882. Sheriffs charity golf tournamentBroward  The Sheriffs Foundation of Broward County and the Broward Sheriffs Of ce are hosting the 2nd Annual Sheriffs Cup Golf Tournament on Monday, May 6 at the Weston Hills Country Club, 2600 Country Club Way, Weston. Registration is at 8 a.m. and. The tournament starts at 9:30 a.m. Cost is $125 per golfer or $500 for a foursome. The money raised will bene t nonpro t charities in Broward County. Visit www.birdeasepro.com/sheriffscup for more information.Classic Car ShowPompano Beach  The Cruisin South Florida Classic Car Show takes place Saturday, April 20 at Pompano Citi Centre at the corner of Copans Road and Federal Highway, from 10 a.m. to 4 p.m. Cars from many different eras will be on display. The juried show is free to the public. There will be special giveaways for attendees. Car owners can pre-register by calling Russ Gagliano at 954-560-5412 or by email at russgevents@gmail.com.Youth basketball registrationOakland Park  Registration has begun for the Summer Youth Basketball League. Parents can register children ages 7 to 16 [as of June 3] at city hall, 3650 NE 12 Ave., or online [www.oaklandpark .org] until the league is full. Registration fee is $55 for residents and $100 for non-residents. There will be separate age divisions for girls and boys. Call 954-630-4506.Recycling cartsWilton Manors  On Monday, April 22, residents in single-family homes will start to receive the new roll-out recycling carts. The 65-gallon carts will be dropped off at each single-family home. Residents can keep their old recycling bins or put them on the curb to be picked-up. Residents can start using their new carts on Monday, April 29. For more information, call 954-390-2100.Seafood Festival returnsPompano Beach  The 29th Annual Pompano Beach Seafood Festival takes place over three days from Friday, April 26 to Sunday, April 28 at the Pompano Beach Fishing Pier, 222 N. Pompano Beach Blvd. Cost is $15 per person per day. Children 12 and under are free. In addition to the food and merchandise sold throughout the weekend, there will also be live entertainment every day and night. On Friday, 5 to 10 p.m., Fourth Dimension and Never Stop Believing will perform. Saturdays lineup, 10 a.m. to 10 p.m., includes Brass Evolution, Ploomie, Low Tides and 38 Special. On Sunday, 11 a.m. to 8 p.m., Two Can Blue, Across the Universe and Jimmy Stowe and the Stowaways will be performing. Part of the proceeds from the event bene t local charities, including local school activities. Visit www.pompanobeachseafoodfestival.com for more information.Low cost rabies clinicFort Lauderdale  Broward County Animal Care and Adoption will host a rabies clinic on Saturday, April 6 from 9 a.m. to 2 p.m. at Roosevelt Gardens Park, 2841 NW 11 St. Pet owners can purchase low cost vaccinations for dogs or cats to protect them against rabies. Cost for a one-year rabies vaccination and registration tag is $15 per pet. Cash only payments will be accepted. To qualify, pet owners must provide proof of Broward County residency, such as a valid Florida drivers license or a current utility bill. No appointment is necessary. Customers are taken on a rst come, rst served basis. All dogs must be on leashes and all cats must be in carriers. Call 954-359-1313.Classic movies for $1Lauderdale-By-The-Sea  In the mood for a nostalgic movie? Every second Friday of the month at 6:30 p.m., a classic lm is played at Jarvis Hall, 4501 N. Ocean Dr. The selection for April 12 is Singin in the Rain. Tickets are $1. Funds raised during the event bene t the American Diabetes Association. On May 11 Dr. Zhivago will be played. Grease will be shown on June 8. Attendees are encouraged to come dressed as their favorite character from the movie being shown. Call 954-449-4368. 12 The Pelican Friday, April 5, 2013 this years capital budget as part of the $1.2 million West Commercial Boulevard streetscape project. Design plans for the area also include four way nding plaza sculptures by Huck, estimated to cost about $100,000. At earlier meetings, Commissioner Mark Brown preferred starting with those four sculptures rather than the entryway feature. This week he asked for consensus on that idea. Only Vincent agreed with Brown and added that he wasnt sure the town should spend so much on the entryway sculpture. He suggested a better location for the piece would be El Prado Park. Im not happy with the cost, and I dont know if this monument at that location says this is Lauderdale-ByThe-Sea, Vincent said. He said more discussion was needed. Mayor Roseann Minnet said she didnt concur with Vincent at all. We have talked about the entry and how when you cross the bridge you dont know you are in LauderdaleBy-The-Sea. This will bring the coral reef to you, she said. It will look magni cent, and at night when its all lit up you will see it before you cross the bridge. Minnet said she feels the entryway sculpture is very important. The piece will make the town visible from so many places. We need that signature as you come into town. Lauderdale-By-The-Sea hasnt created its own picture frame, and this will start that. The mayor then read portions of a letter from the artist, Laura Huck. Art is a great uni er and de ner of a community. I can only think how natural it is for everyone to take note of the pelican sculpture at the end of Commercial Boulevard. The series we have planned will be even brighter and more eyecatching. Not only that, it will draw attention to the treasure trove of accessible reef off your beaches. Very few improvements to a townscape, such as you are planning, will have as much impact as the art. Huck said the main piece, the Coral Arch, is the rst thing people will see as they enter the town. It will say, This is not an ordinary community, but a community with much to offer. The Coral Arch is designed to wow, in the day with its bright colors and details, and at night, when lit, with its glowing rays. Minnet urged commissioners to approve executing the agreement and to start with the Coral Arch. Commissioner Stuart Dodd said he agreed, that the Coral Arch sculpture makes a huge statement. I think we should go ahead. Vice Mayor Scot Sasser said he was in full agreement with the mayor and with Dodd. Were talking about the entry and a true piece of art. Sasser, however, still seemed baf ed by an earlier decision. I think Im in a dream world when everyone voted for a 33-foot Las Vegas parking lot sign to put in the center of the downtown. [That sign was later modi ed to 30 feet.] This [the entryway sculpture] is much more important than the other, he said. Vincent said he never SculptureContinued from page 1suggested the entryway sculpture wasnt a beautiful piece of artwork. It wont be seen or recognized at that location. It wont be appreciated by pedestrians or by vehicular traf c going east.State approves $100,000 grant for landscaping on Commercial In related news, Town Manager Connie Hoffmann announced Tuesday that state of cials have approved the towns grant application for $100,000 to assist with landscaping costs for the West Commercial Boulevard streetscape project. This is a matching grant from the Florida Highway Beauti cation Council, and the town is committed to match it with $202,000 in additional landscaping monies. Hoffmann credited staff member Pat Himelberger and Hugh Johnson of Architectural Alliance for their work on the grant. Himelberger wrote the grant application, and Johnson modi ed the tree selection to improve the towns chances getting the funding. Lighthouse tours April 20Hillsboro Beach  A tour of the Hillsboro Lighthouse will be offered Saturday, April 20. To participate, meet Hillsboro Lighthouse Preservation Society members at the Sands Harbor Marina, 125 N. Riverside Drive, Pompano Beach, beginning at 8:45 a.m. The rst boat launches at 9 a.m. and the last boat leaves at 2:30 p.m. The tour is free for Hillsboro Lighthouse Preservation Society members and $15 for non-members. The annual cost to join the Preservation Society is $25 for individuals, $35 for a family, $50 for a business and $500 for a lifetime membership. For more, visit www.hillsborolighthouse. org or call 954-942-2102. 16 The Pelican Friday, April 5, 2013Send your events for publication to mdpelican@ yahoo.com municipal contract in 2012 in Miramar breaking into a market controlled for 20 years by Wheelabrator, a subsidiary of Waste Management. Its website cites its commitment to zero waste for the cities it serves and its contracts guarantee 75 percent of the solid waste collected will be recycled.HillsboroContinued from page 3 more claims than any other chapter, more than 500 a year. A large number of the vets applying for assistance here qualify because the government has taken responsibility for the illnesses caused by Agent Orange which has a long list of diseases from cancer to arthritis associated with the chemical. And it has now been determined that the chemical still affects future generations, the grandchildren of the Vietnam servicemen. To establish exposure to Agent Orange counselors have to match the veterans service record with military records that show the exact place time and amount of Agent Orange that was used to defoliate the jungles. Having access to all this history is important to the outcome of the claim. The local DAV volunteers VetsContinued from page 1are available 10 a.m. to 2 p.m. every Tuesday at the Legion, 820 SE 8 Ave. No appointment necessary. Additionally, these volunteers spend four days a year being recerti ed at a seminar held at Lake Mary, FL. The system is intimidating and these guys know the language of the VA, says Acting Cmdr. Don Carney. Im not dumb, but it confuses me. Since the damaging effects of service-related injuries may not occur for years, returning vets from Iraq and Afghanistan need to start keeping track of their records now for future needs, Roth said. The VA compensates for physical and mental disabilities and, for veterans or their spouses on very low incomes, provides a pension. Bene ts, if awarded, are retroactive to the date the claim was started. Healthcare is available at VA hospitals with a minimum of paperwork. Often these disabilities dont surface until the vet ages requiring years of documentation. While these local service of cers are skeptical that the VA will go electronic anytime soon, they are looking for sponsors who will contribute money for computers, printers and wi so they will be ready when it does happen. Indicating the work going on behind him, Carney said, These guys are doing the right thing. Id like to see it get known that they are available. While the DAV does not give direct nancial assistance to vets in need, members of the chapter provide transportation, visit nursing homes to help residents with their claims, make some home repairs. They stress that all their time and their talents are given for free and caution that anyone being charged a fee to get help with their claim application is being ripped off. One widow who met with them this week reported being charged $750 by a VA rep. The service of cers also advise their clients of other legal rights such as the additional Homestead Exemption. Said Citrolo, The reward is in helping people, and Butler added, We are handful of people who dont mind ghting for other people. The local DAV chapter raises money by holding car shows and golf tournaments and manning their information booth at public events. Other service of cers from the Goldcoast Chapter are Bob Kontz, Jim Zane, Dave Nystrom, Gerg Chaipponi, Tom Perry and Chuck McLaughlin. The Pelican 27 Friday, April 5, 2013 In my artwork, I paint when I see it, she said. Wetzsteins work also comes from what he spots. Along with frames for Andersons art, he also takes ArtHallContinued from page 21driftwood and mostly turns it into tables and lamps. I came from the Keys so Ive always been in the mangroves with my dad. And hes not too picky. Wetzstein has found and used pieces of oak, Dade County pine and tiki. But his favorite is mahogany, especially the stuff that drifts here from Cuba. His greatest find was a refugee boat in the Keys last year. That had a lot of real colorful wood. Anderson and Wetzsteins work will be on display at the CRA Business Resource Center until April 16. Call 954-5861111 for more information. Andy Cherenfant, loan manager for the International Enterprise Development, with Srah Ysrael, a volunteer at the Business Resource Center, at the wine table at ArtHall on March 20.Tell The Pelican about your news! Email mdpelican@ yahoo. com or 954-783-8700!